One of the best ways to learn is by watching how others do it. The problem with professional marketing coaches is that they forget there's another part to this strategy. These coaches sell generic marketing methods that are designed to work for any industry. It's rare to hear someone say they're a professional marketing coach that SPECIALIZES in a specific industry. Professional marketing coaches are in it to make money, so they want to entice a wide range of business owners to their seminars. After all - the more, the merrier (and the more money they make). They sell all these marketing plans and ideas, and you think you're getting great advice until you realize they're missing on one key part: diversity. Everyone who buys their CD set or attends their seminar is going to leave with the exact same information. The professional marketing coaches never tell them that to truly make their marketing tools work, the consumer needs to tailor those base ideas into something workable for their company. This is why if you're going to seek professional advice for your legal marketing, you need to be looking to those who understand your industry and understand how to personalize broad marketing concepts. So who do I turn to? The best way to get a tighter reign on your legal marketing is to seek advice from those who have been there before. This is exactly what I did when I was developing the strategies and methods I teach in my Great Legal Marketing SuperConference. I looked around at my peers, at other successful businessmen (not just lawyers!) and the entrepreneurs who made a difference. 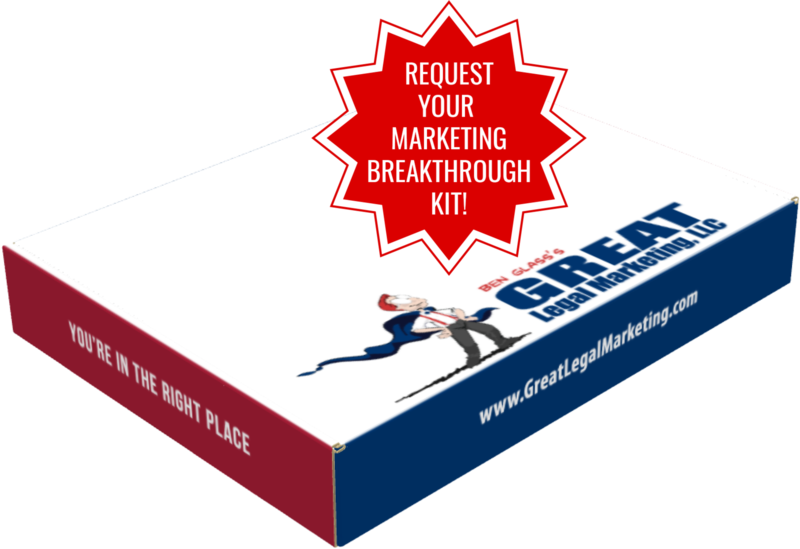 With Great Legal Marketing I've done a lot of the work for you. I've taken a lot of the strategies the professional marketing coaches teach and tailored them to work specifically for legal marketing. I've focused a generic concept and now I'm offering all that to you, neatly wrapped up in a concrete action plan. This way, you actually learn how to create customized legal marketing for your law firm.